When planning a Colosseum tour, people typically jump directly to any option that includes the Colosseum underground. Don’t get us wrong–we are huge supporters of the Underground, but what about the other restricted access area of the Colosseum? Here’s why you should visit the Colosseum Top Levels. We don’t want you to waste a moment of your precious time in Rome. 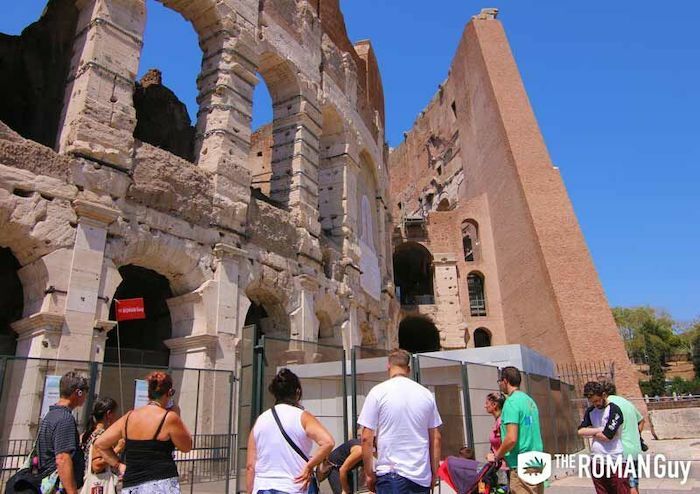 That’s why we have designed our Colosseum tours to skip the line and visited restricted access areas that you wouldn’t be able to visit on your own. Check out our Restricted Areas Top Levels Colosseum Belvedere Tour as well our other excellent Colosseum tours to make sure you get the best experience possible. When you visit other restricted access Colosseum areas, like the Underground or Arena Floor, you don’t get to enjoy the insane views of Rome that the 5th level does. The fifth level of the Colosseum is actually called the Belvedere, which is why you’ll see that word in our tour title. The word comes from two Italian roots; Bel, meaning beautiful, and Vedere, meaning view. Seems pretty fitting for such a vast view of the Eternal City. From this viewpoint, you will be able to see a detailed landscape of Rome. You’ll see all of the Roman Forum, the archaeological ruins that used to serve as downtown Rome. And most importantly, you’ll be able to look down at all of the other Colosseum visitors wishing they had access to this insanely cool lookout point. Depending on the experience, Colosseum tours can cost over 100 euros. Of course, these tours usually include the exclusive Underground and comprehensive Roman Forum tour. Our Restricted Areas Top Levels Colosseum Belvedere Tour offers a skip-the-line tour for just over 60 euros per person. This is a great way to see the Colosseum on a budget. And, you still get a guided tour of the Roman Forum as well, so you really are getting a true bang for your buck. Second to the Vatican, the Colosseum is without a doubt the most crowded attraction in all of Rome. In a given year, over four million people visit the Colosseum. This means that during your visit, the Colosseum can be inundated with people. 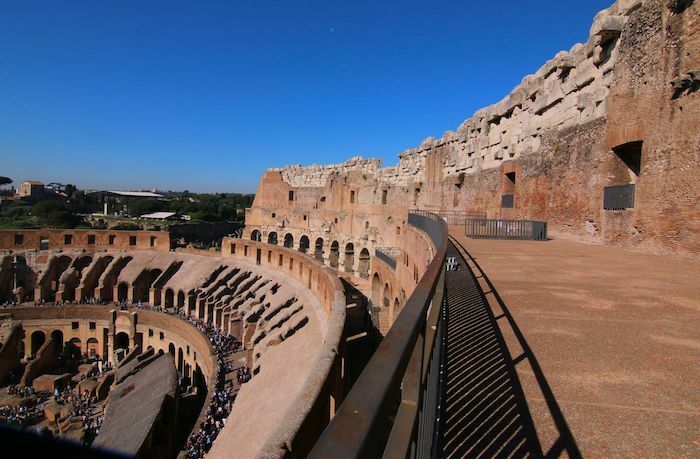 The most popular areas of the Colosseum include the lower levels, where anyone with an entrance ticket can visit. The underground and Arena Floor are a bit more exclusive, since only tour groups can visit these sites. If you choose to visit the Colosseum top levels, it’s possible you will be the only group up there. Imagine standing up on top, looking down at the tour groups looking back up at you, wondering how you got up there. That’s really what our Top Levels experience is all about: experiencing the Colosseum’s less-visited site with a smaller tour group and very few crowds. The lines to get into the Colosseum can be quite daunting. Without purchasing a guided tour, crowds can wait multiple hours to see the interior of this great Roman amphitheater. With our Colosseum tours, though, you don’t have to do that. 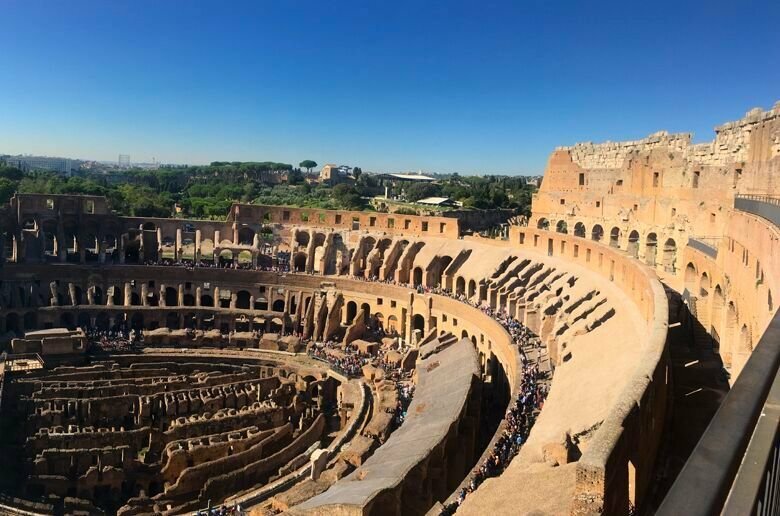 We work with the Colosseum to get our groups in through the Colosseum back door, where you will experience no wait time and a significantly shorter security line. This special entrance really makes your restricted access Colosseum tour worthwhile.